Joelle Fontaine's designs are bold, breathtaking and built to be noticed. Joelle Jean-Fontaine is the founder of Kreyol, a boutique label that is quickly weaving it's way into the heart of the fashion industry. The craftmanship of clothing is in Fontaine's Haitian blood. The daughter of a seamstress, she started designing at just 13 years old. Fashion began as a hobby and creative outlet for the designer, but it didn't stay that way for long. At 20, when her family took off before her college career did, Fontaine found balance doing what she does best--sewing. Fontaine's designs are very much like pieces of art and she incorporates signature details like layering, ruching, and texture to great effect. And since Joelle made her professional debut a few years ago, her stock has been rising higher than hemlines on mini-skirts. She's found stunning muses in fab twin singing duo Aaries (Ayana & Ayinke Hipps), and has been in constant demand as a stylist. 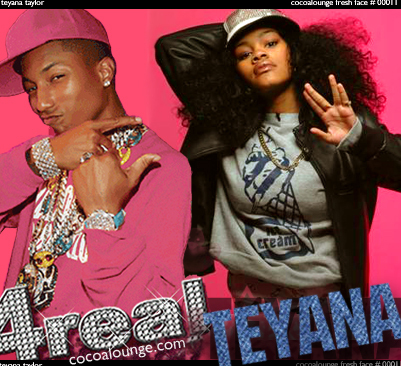 Her impressive resume includes urban magazines The Fader, and Trace's popular Black Girls Rule! issue. Business woman. Fashion Designer. Mother. 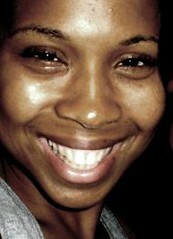 Wife. Joelle Fontaine is a young woman proving it can all be done...and with jaw-dropping style! 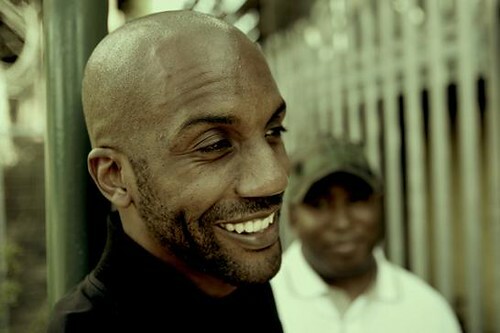 UK Super Producers Marc Mac and Dego of 4hero. 4hero is like Zero 7 with an urban kick. Ursula Rucker is Philadelphia's reigning "Queen of Spoken-word." Together, they're pure magic. Check out this interesting Saturday Soul video addition, a fusion of Drum n' Bass, poetry and dazzling graphics. 100% soul. 100% original. Enjoy! Paula Patton plans to find out why "pimpin' ain't easy." After the critical success of 2005's Hustle and Flow, Hollywood is getting underway on another pimp tale, but what separates this story from the pack, is its lead character: a woman. Paula Patton, of Idlewild and Deja Vu fame, has signed on as the lady for the job and her husband Robin Thicke, is reportedly in talks to help out. NEW YORK (Hollywood Reporter) - Chart-topping R&B artist Robin Thicke is in negotiations to write his first film score for the urban drama "This Wednesday," with wife Paula Patton attached to star as a female pimp. The feature from writer-director Christine Crokos (The Seat Filler) is inspired by the true story of a female pimp in Atlanta. "Wednesday" will be expanded from Crokos' 2001 short "Heroine Helen," about the same character. Depending on how the subject matter is handled, this film could be a real character study or just a real let-down, we're hoping for the former. But with early buzz and interest already generating, Wednesday's team is most likely on the ball. They may even be able to bring Lil Kim onto the project to pen the Oscar-nominated theme song, "It's Hard Out There For A Pimpstress". 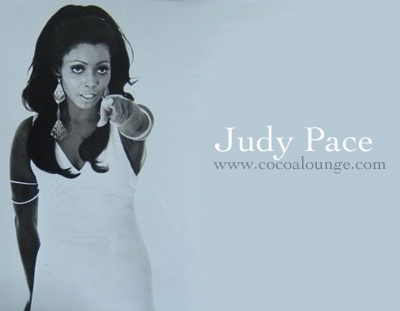 Judy Pace started her career by entering a beauty pageant and failing to win in a single category. A student at Los Angeles City College, Judy had hopes of earning a degree in sociology when a leg condition that she had suffered from as a child returned. She was hospitalized for months, during which time she decided to pursue her lifelong dream of becoming an actress. Pace found small roles in The Candy Web (1963), The Fortune Cookie (1966) and was a regular on the now classic tv hit, Peyton Place from 1968-1969. She would also co-star in the acclaimed, but short-lived series, The Young Lawyers. 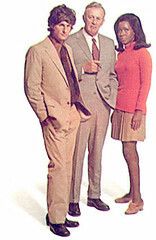 During the Black Action film explosion, Judy starred in the Ossie Davis-helmed Cotton Comes To Harlem (1970), Cool Breeze (1972) and The Slams (1973) (with Jim Brown ). She co-starred in the first-ever made-for-televsion film, Brian's Song (1971) as the on-screen wife of Billy Dee Williams. Judy Pace's star rose quickly, but unfortunately, after 1973 she would be seen in very few films. She later married Baseball Hall of Famer Curt Flood, a marriage that lasted until his passing in 1997. Since then she has carried the torch for Flood, becoming a spokesperson for free agency in professional sports. Judy also co-founded The Kwanzaa Foundation with Star Trek legend Nichelle Nichols. We'd love to see Judy Pace return to the screen in a major role to push the doors she opened for young black actresses in the 60's, for today's actresses now in their 60's. Woman Power Style! 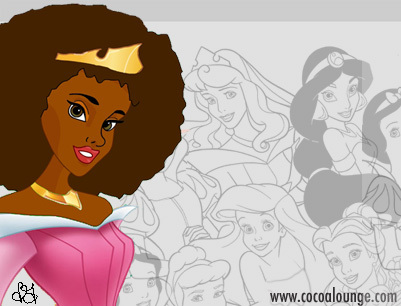 Move over Snow White: A Cocoa Lounge illustration inspired by Disney's The Frog Princess. 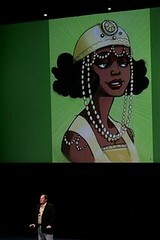 It has been years in the making (and with a release date of 2009 it still is), but Disney has finally announced plans to feature a black heroine as its title character in the upcoming Frog Princess. The film, scheduled for release in 2009 by Disney Feature Animation, is the first hand-drawn film the company has committed to since pledging last month to return to the traditional animation form that made it a worldwide brand. "The Frog Princess," a musical scored by composer Randy Newman, is "an American fairy tale" starring a girl named Maddy who lives in the French Quarter in New Orleans, said John Lasseter, chief creative director for Disney and Pixar Animation Studios. Maddy joins eight other Disney princess characters that have generated $3 billion in global retail sales since 1999. Disney Princesses is the fastest growing brand for the company's Consumer Products division. Disney introduced its first non-white animated heroine in its 1992 film, "Aladdin" with the Middle Eastern character Jasmine, and followed it three years later with the Native American princess "Pocahontas." The creation of the Chinese heroine from "Mulan" came in 1998. Other Disney princesses include the main characters from the films "Cinderella," "Sleeping Beauty," "Snow White and the Seven Dwarfs," "Beauty and the Beast," and "The Little Mermaid." The Consumer Products division aggregated the eight characters in 1999 under the banner "Disney Princesses" and has rolled out toys, books, clothing, furniture and other merchandise aimed at girls ages 3 to 8. Disney Chief Executive Robert Iger said the company wanted to show its support for New Orleans, only partially rebuilt 18 months after it was flooded by Hurricane Katrina, by holding its annual meeting and setting its newest animated film here. "We thought it would be a great signal to send that New Orleans is important, that we believe in New Orleans, and in a way it was our means of not only expressing some appreciation but of giving back," Iger told Reuters in an interview. "This is a town we have derived great stories from." Alicia Keys is said to be in talks for the role, but Raven Symone seems like the more obvious choice for Disney. Time will tell. 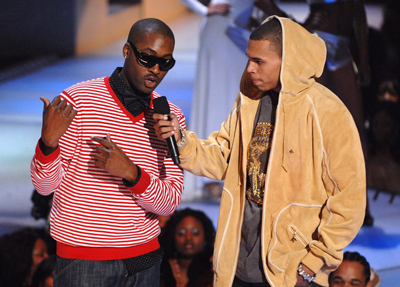 Michael Knight Reveals New Collection on BET's "Rip The Runway"
Fashion designer Michael Knight speaks to the show's host singer, Chris Brown. Project Runway finalist Michael Knight unveiled his spring collection during BET's star-studded, hip hop fashion extravaganza, Rip The Runway. Introducing his label Mychael Knight, the young designer presented a body of work decidedly more refined than his New York Fashion Week collection, but not straying away from his hip hop roots. On a runway that saw urban staples Apple Bottoms, G-Unit, and Baby Phat rip it, Knight's hip hop chic signature fit right in. It's hard to categorize Lizz Wright's sound and that's probably just the way she likes it. Though often described as a jazz singer, Lizz Wright's voice falls somewhere in between genres and her style is unlike any of her contemparies, which simply means the girl is in a League of Her Own. Here's Lizz performing "I'm Confessin'" Live in Basel. If you enjoy this one, you'll also love her spin on the classic, "Nature Boy". Just wait for it, after the long--but entertaining--drum solo.